On April 18th Vigilance OGM launched the Demand Labeling! campaign for mandatory GMO labeling in Quebec. 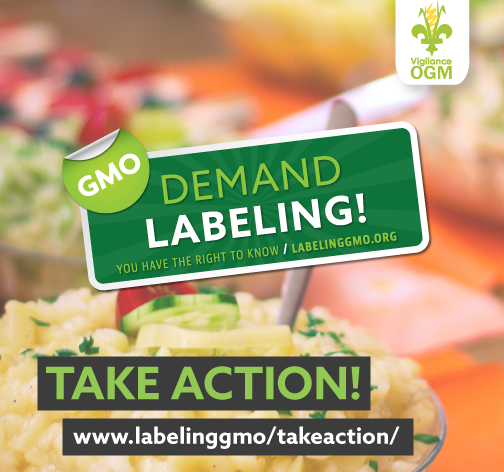 On April 18th Vigilance OGM launched the Demand Labeling! campaign for mandatory GMO labeling in Quebec. The campaign demands that consumers have the right to know what can be found on our farms and on our plates, and is allied with both the North American movement for GMO labeling and the global movement for more local and less chemical agriculture. Why a campaign for mandatory labeling in Quebec? In 1995, the Canadian government approved genetically modified organisms (GMOs) for farming and GM corn, soy, canola and sugar beets appeared in Canadian fields. Designed either to produce their own insecticide or to resist herbicides (or both), these crops—used extensively throughout North America—have permitted five biotechnology multinationals to corner the market on these seeds and pesticides. After 20 years, during which no tracking and labeling system was set up for these crops, questions about the impact of GMOs on our health, environment, and economy still remain unanswered. 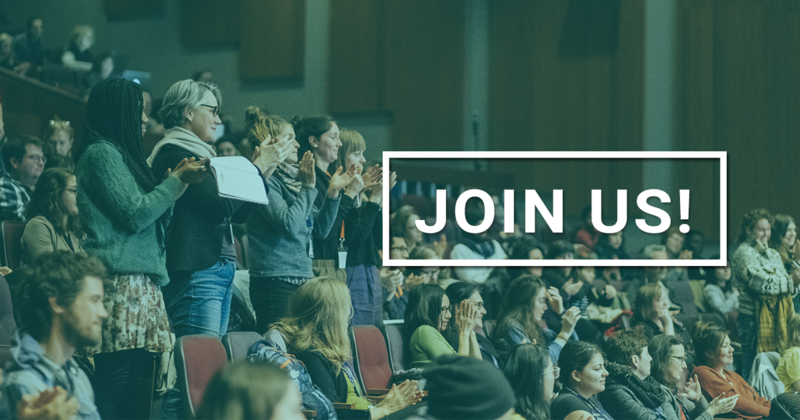 A global movement for transparency and better regulation of GM crops is growing. Sixty-four countries have already implemented mandatory GMO labeling, and the US state of Vermont passed a law for mandatory GMO labeling in 2014, which will come into effect July 1st, 2016. Since the Vermont law was passed, six food industry multinationals (Campbell Soup, General Mills, Kellogg’s, Mars, ConAgra Food, and Nestlé) have decided to embrace GMO labeling for their products in all 50 states of the US—not just in Vermont. Furthermore, those companies are calling for federally required labeling throughout the US, in order to avoid the expenses that state laws would create for them. The little state of Vermont, which makes up just 2.8 per cent of the US population, has had an impact on the food industry. Canada is one of the fifth biggest GMO producers in the world, and in Quebec alone, there are more GMO plants seeded than in 177 countries worldwide combined. Most of that is accounted for by the corn and soy crops planted in the Montérégie region. However, 2015 marked a decline overall in acreage planted with GMOs in Quebec [in French]. Also, organic farming has continued to increase in the province —by 66.6 per cent between 2001 and 2006. Farms are shutting down in record numbers [in French], while at the same time there has been a 300% rise in registrations with Quebec’s one-of-a-kind organic farming training program [in French]. Agriculture is clearly changing in Quebec as the demand grows for local, in-season, organic products, and more farmers measure greater benefits from non-GMOs [in French]. GMO labeling is a major part of the solution to the problems brought on by GM crops. However, more solutions must be considered, especially to avoid contamination from GMOs, which poses a threat to farmers using organic methods. In April 2016, a small quantity of GM alfalfa—approved by Health Canada in 2014—was sold for the first time in the country. Alfalfa is an essential crop for family farms all over Canada, and for the production of several organic foods, but contamination risks are very high from GM alfalfa because alfalfa is a perennial plant pollinated by insects (especially bees) and very small seeds. Cases of contamination with other crops have already happened, such as in 2009, when Canada was banned from exporting flax to Europe following a contamination problem observed in 35 countries. To take action against GM alfalfa, visit the CBAN website. 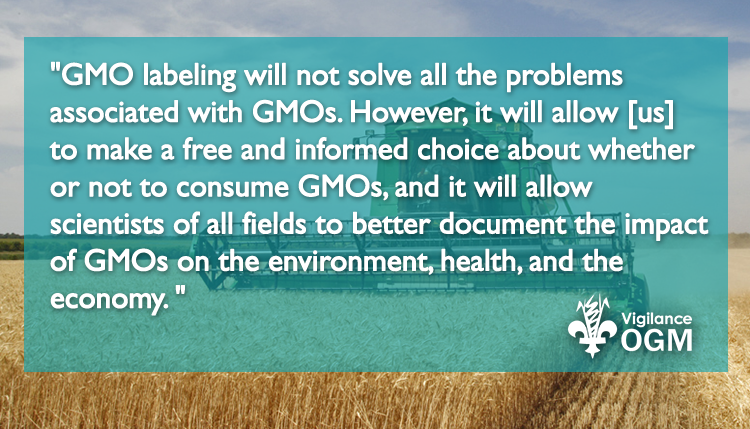 GMO labeling will not solve all the problems associated with GMOs. However, it will allow Quebecers to make a free and informed choice about whether or not to consume GMOs, and it will allow scientists of all fields to better document the impact of GMOs on the environment, health, and the economy. Quebec, the first province in Canada to manage certification for organic products in 2005, stands ready to distinguish itself and lead the rest of Canada toward mandatory labeling of GMOs. Together, let’s make Quebec the first province in Canada and the second jurisdiction in North America to win mandatory labeling!